Pumpkin seeds have several health benefits and we admit that but ignore them for some reason. It is important to learn the pumpkin seed health benefits and use them regularly. Pumpkin seeds are a rich source for Manganese, copper, magnesium, zinc and Iron minerals and plenty of proteins with limited amounts of A and B Vitamins. The antioxidants in pumpkin seeds improve the immunity to fight the frequent diseases. The phenolic compounds fight the free radicals that could cause cancer. These improve lifeactivity of the body and help to remove any antibodies. Making use of pumpkins seeds in daily life can improve sleep, can prevent kidney stones. Certain elements in these seeds could help to increase bone density thus help in preventing osteoporosis. Phytosterols in pumpkin seeds will help in reducing bad cholesterol and blood clotting thus prevent heart attacks and paralysis. High content of copper is found in pumpkin seeds which generate red blood cells and help in free flow of Oxygen in the blood, that reduces Sodium naturally and thus reduce chances of getting Blood pressure. 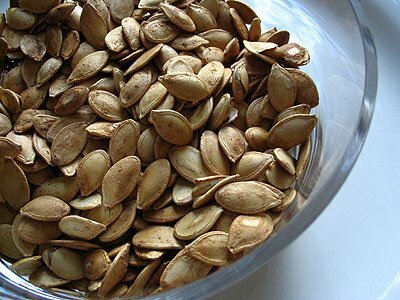 The calories are high in pumpkin seeds so people with obesity should balance their use.